Reverb is one of the most common effects used by both guitarists and producers. Still, it’s an often misunderstood effect and if used wrong, it can do more harm than good. In this feature we’ll look at different types of reverb and the do’s and don’ts when it comes to using reverb as a part of your guitar tones. Update of post originally posted April 24 2007. Reverberation, or reverb, is essentially sound reflecting off a surface creating a feedback with different time and decay. The surface could be anything – a wall, furniture, persons etc. The larger the space the larger the reverb will appear. Going to a concert at a large venue, like and indoor or outdoor stadium, will give the impression of the band being drenched in reverb. What you hear is the sound from the stage and PA system being reflected on the venue’s surfaces creating a big reverb. In a small Club, the band will sound dry and tight, because the sound reflects earlier. A large reflecting metal plate used in studios in the 60s and 70s. Reverb can be replicated or simulated either mechanically or digitally for use in music. Plate (an actual metal plate reflecting sound) and spring (sound fed through one or more springs) are mechanical devices often used in studios and guitar amps in the 50s and 60s. They have a distinctive sound and are still favoured by many producers and guitarists for their unique and vintage flavour. 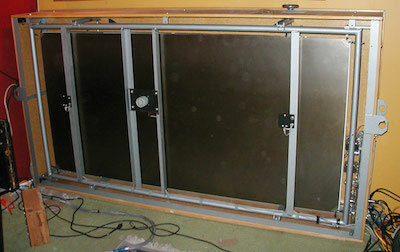 Digital reverb appeared in the late 70s. These are units, either studio hardware/software or pedals, that simulate different types of reverb, including plate and spring but also natural reverb (church, hall, small room etc). Some units can also create artificial reverb with different effects added. Reverb is always used on recordings in some form (I think Slayer’s Reign in Blood was recorded without any reverb to create an overly aggressive tone). A producer will often use a short reverb on an individual track or group to create a room, allowing some separation between the tracks or instruments. Reverb can also be added on individual tracks or groups to create a specific effect. 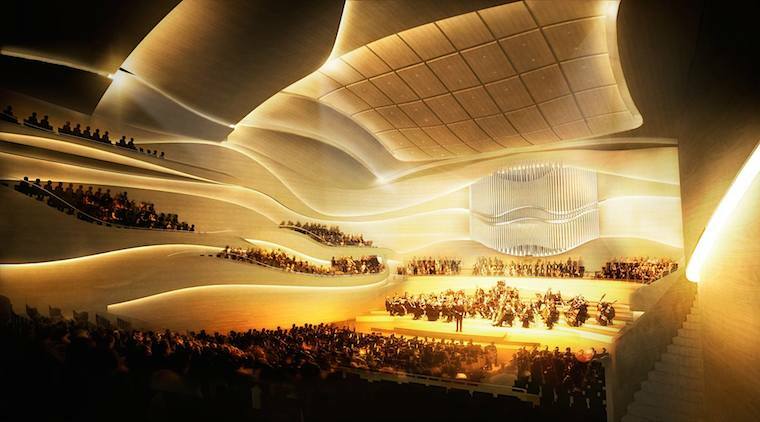 Strings and orchestra might get a reverb resembling a concert hall or a small room for a quartet, while guitars might get a digital spring simulation or perhaps a large hall for that special effect. Reverb can also be achieved in the recording process, utilising the ambience in the room. A common trick is to place a drum kit in a hall or a room that has a unique reflection character. Placing a microphone a foot or more away from the guitar cabinet will allow the tone to breathe and the mic will pick up some of the sound reflecting in the room. Another approach is to play back a recorded signal into a room and re-recording the ambience. This was a common trick in the days before plates and spring, where producers would use reverb chambers. Common for all techniques is that you want to create the illusion of space and a more lively and open sound. Without reverb, a recording would sound flat and less real or alive. Our ears hear and use reverb or the reflection of sound to calculate space and orientation. A typical spring unit seen in Fender amps. A typical bedroom or rehearsal studio will sound pretty dry as the reflection time is short. Your guitar doesn’t sound anything like those huge stadium tones you love and desperately are trying to achieve. It’s therefor tempting to drench your guitar in a huge reverb but this can do more harm to your tones than good. As explained above, the reason for using reverb is to create the impression of space. In that regard, using reverb in a small room like your bedroom, makes sense. However, reverb created by an effects unit will in many ways sound authentic but it won’t be the same as having a pristine tone coming from your amp and reflecting off the surroundings. A big reverb sounds impressive but the tone you’ve worked so hard on to achieve will sound coloured and less dynamic. The result is often that you need to adjust the settings on your amp and pedals to compensate. Using reverb on a stage can do even more harm to your tone. Again, reverb is used to create space but a concert venue already have lots of natural reverb or ambience as the larger space will create bigger reflections. You’re basically trying to simulate something that’s already there and your guitar will have a hard time cutting through a dense band mix. Sadly, your loyal fans in the back will have a hard time hearing your guitar properly. – No. The signal coming from his amps is dry. No reverb. What you hear on the album is a mix of his cabinets (both mic’ed and from the sound board) and ambience from mics placed around the stage and hall. Reverb was also added in the mixing of the album to create the impression of being in the audience when listening to it. – No. Thatâ€™s delay (or echo) created by the Binson Echorec echo machine. Tape, disc and analog echo in general has a warm tone and often some modulation cased by wear and old parts. This creates a very musical echo that when blended with an instrument gets an almost reverb-ish character. The Binson in particular has a very spacious and “wet” tone. – Yes, he often does. Most of the guitars on On an Island appears to be fairly dry with little or no reverb (perhaps just some room used in the mixing). Only delay was used, either as a part of the recorded tone or added digitally in the mix (mostly the former). Momentary Lapse of Reason and Division Bell however, has lots of reverb added to the guitars to create a lush and spacious mix. As much as there are no rules when it comes to guitar playing, the rule is that you should never use reverb on your live guitar (bedroom, rehearsal or stage) unless it’s for a specific effect. Fire up those big tones! Spring reverb is my favourite. The mechanically achieved effect was originally featured in guitar amps in the 50s and 60s. It has defined that era and guitarists are once again beginning to appreciate its unique tone. Spring reverb is instant surf, 60s pop and early punk. Today it’s either used to replicate that vintage flavour or, as Steven Wilson often does, used for dirty and strange sounds. EHX Holy Grail Max, TC Electronics Hall of Fame and Strymon Blue Sky. Great sounding reverb pedals offering a wide range of different reverbs, including plate, spring and hall. Guitarists such as Sigur Ros’ Jonsi and Jakob’s Jeff Boyle use different types of digital hall reverb as part of their tones and often blended with delays. The effect is dramatic and creates long sustained notes and chords sounding close to a synth. Using delay or echo is an effective way to create the impression of a bigger tone, while maintaining much of the original signal. This is one of David Gilmour’s trademarks and something he master like few others. Analog echo in all its forms, can create the impression of reverb and make the guitar sound both more sustained and bigger. Digital tap tempo delays allow you to play patterns and rhythms to a beat. U2â€™s The Edge wouldnâ€™t be much without his delays and while he often creates walls of sound, the tone is pristine and defined. Blending different delays can also be an effective way of creating a bigger tone. Again, this something Gilmour often do – blending two delays with different time settings like on Run Like Hell and when replicating his old Binson multi head repeats with digital units. What’s important is that you create a guitar tone that you like and one that will inspire you to play, practice and maybe even write some music. If that means layering a thick blanket of reverb on your tone then go for it! Still, be aware of what your effects actually do to your tone and don’t use them just because you think you need to. Reverb can be a great effect if used right but it cause a wide range of problems and issues if used wrong. Please feel free drop a comment and share your experience and thoughts on using reverb! Wonderful and helpful article as always Bjorn. A wonderful delay pedal to try is the Digitech Polara Reverberator. It has 7 Lexicon reverb and it’s absolutely splendid. Anyway, I do have a question. My hand is a Pink Floyd tribute band and we’re close to being able to play in bars and such. How would you suggest getting those enormous sounds in bars and my high school auditorium (seseets 250-300 people). Thanks a ton Bjorn. You’ve helped me out a lot already. Depends on what you mean by enormous sounds. Your tone will sound tighter and cleaner in a small venue due to the short reverbation. Personally I would use delay and also try to beef up the tone with a bit of compression and pedals that has more mid range. You can add reverb to create that huge space but as I’ve discussed the feature, it will make the sound cut through less. I recommend using large reverb sounds only for special effects and tones but there are no rules. Blending long tap delays with shorter delays will also make your tones bigger and add to the sustain but be careful with the overall mix between the two. So for tones like Time and the solo as well as fill-ins for Echoes and things like that, would you say that running the fuzzface into a TC Electronic Nova Delay with 310 ms delay and 3-5 repeats into a huge hall reverb would work? Hi Bruce! Unless you’re using reverb for a specific effect, like spring or long ambient wash, you should should match the amount to the room. A smaller room may need more reverb than a bigger, if you are compenasting. If a list say that you should use reverb then consider why. Is it to create a specific effect or, just to create some sort of room? In most cases, you really don’t need to use reverb, as I’ve explained in the article. People on the third row and back will only hear the room ambience anyway and if you add more reverb on top of that, unless it’s for a specific effect, your guitar will be harder to hear. Now, whether or not a guitar cuts through depends on other things as well, like volume, mid range and compression. A Fender amp with single coils and a transparent overdrive is not cutting nearly as much as a Hiwatt or Marshall with humbuckers and a Tube Screamer. Read more about that here. Just one question which I cannot deal with – sound localization. For example, guitar solo in Another Brick in the Wall Part 2 mixed in the centre and has plenty of depth. It makes the solo so dramaticly. Or Wearing the Inside Out, that also has a localized guitar solo. Or most of other Pink Floyd’s song. You have an excellent experience with mixing and mastering the songs, so would you give me some tips for it? Or usefull articles about it? Perhaps any VST plugins such H-reverb or something like that? I’m very confused with it because adding some reverb usually makes the sound a bit more smooth and pleasent without accurate localization in the space. Hi Alex! Not quite sure what you’re looking for. Do you mean in a band setup or mixing guitars on a recording? Are we talking about panning the tracks or how to use reverb and delays? Seems I have dealed with it – I created two different tracks (buses) – the first one with delays, the second one with reverb – and sended the dry signal to them, so the guitar tone became smooth and pleasant, stayed clear at the same time. Moreover I managed to localize the signal, moving delays and reverb faders up and down. So just one more question – is it necessary to use a delay pedal (any thoughts about Mooer Reecho?) if now I just play and record home? By the way, It would be great if sometime you told us about you own experience in mixing songs or just a guitar, or mixing a guitar with any backingtrack there :) You sound very gilmourish, and I mean not just playing, but also mastering your song and tracks. OK, yes bus tracks makes everything cleaner and the project run more tidy. Unless I want a very specific effect I always mix in delays and reverbs and record dry, with only dositortions and modulations. Again it depends on what tones you want and what you’re most comfortable with when recording and mixing. I find that it’s easier to add delays and reverbs in the mix to be able to keep everything as clean and easy to place as possible. Hi everybody am not an expert and neither a thecnician in sound production but usually I have to use a sono in various places for public meeting. And my problem is that usually in hall meeting the sound produce without any effects is so blurred that the audience have dufficulty to understand the speaker’s words. Can someone please advice me how to solve this problem. Depends on the acoustics in the hall I guess but I’m no expert on PA sound. You seem prefer delay than reverb …. And you wrote it could be a good idea to use two different delays. When i ear your jams it’s sometimes like you where playing in a cathedral …. What’s your secret ? Is it in the mix ? You can set up different delays with different time signatures and create a reverb-like tone. Doesn’t really matter what delay pedals you combine, although analog or tape simulations, with a hint of modulation often sound bigger than digital delay. I often use a combination of tap tempos, like one to the beat and one 1/4 note. I found a rickenbacher moved to los Angeles in 1918 and changed the spelling of his last name to rickenbacher in 1925 and I have a steal lap electro with his last name spelled rickenbacher. Can you tell me anymore about it. Fist of all I would like to congratulate you for your fantastic Gilmour database. I am sure you are proud of your work. Regarding reverb, independently if David Gilmour use it or not is not, it is not the question to be asked in my opinion. “The dynamics” of all those PF recordings are what we all are trying to replicate right? and yes, unfortunately this can be only achieved with pedals. I myself did not like reverb for many years, and I have now two different reverbs on my board ( 7 pedals in total) which it might sound ridiculous, but it can really do magic depending on the song and setting. Hi Carlos! Thanks for your kind words! You’re absolutely right. Most of us are trying to replicate what we hear – or think we hear. I guess what I’m trying to do, is to provide an accurate picture of what’s really going on because one can easily be fooled into think that reverb is the answer to everything, while it can really do more damage than good. I also think it’s more important if you’re playing alone at home, as compared to with a band, where a delay will provide all the magic you need. Out of curiosity in Marooned, is that the Pete Cornish soft sustain creating most of the crazy spaciousness in the background guitar texturing with the octave pedal? (or slide – tough to tell really) Thanks! Not quite sure what you’re referring to but the guitar, whammy and overdrive alone would sound all dry. The spacious sound you hear, is mostly delay and some modulation created by the Rover Maestro revolving amps he used for the session and some reverb added in the final mixing. More or less the up and down soaring sound that’s heard throughout the song in the background. It actually starts before the main solo as a kind of a segue as the note ascends but still continues throughout. I’m not entirely sure if I’m mistaking guitar with the synthesizers. Not quite sure what you’re referring to but there is some sort of low note cello, which I think is a synth, going on and lots of ambient sounds but nothing is guitar, as far as I can hear. I’m pretty sure the sounds your on about are created by David using a pitch shifting effect pedal on his guitar. I think the pedal he used is called something like Digi Tech Whammy Pedal. Yes, that’s the effect used on the lead guitar. Think what Justin referred to, was some ambient sounds in the background. That’s what I thought that was. But there was a lot of stuff going on so it was tough to differentiate. It sounds like there’s a lot of ambient synth trickery going on as Bjorn said but the sound I was referring to definitly sounds like the pitch shifter. Thanks everyone! Ok, thank you Bjorn I think I read somewhere that David Gilmour adds the reverb in the mix but I couldn’t remeber, so thank you for clearing that up for me. Thank you for the reply Bjorn. I have another question if you wouldn’t mind answering? Has David Gilmour ever used an effects pedal or was the reverb added in the mixing of the song or was the reverb on the songs from an effects rack? To my knowledge, he has never used a reverb pedal or rack system. His live tones are all just one or two delays and for the studio tones, any reverb is added in the mixing process. I don’t understand why after the reverb FAQ you say don’t use reverb in your bedroom. This makes no sense to me. Am I misunderstanding something, I use reverb all the time in my bedroom and it sounds fine. I agree with not using reverb live in a hall or somewhere big like that but in a room such as a room in a house doesn’t seem like a bad thing. I would be very great full If someone could explain to me why its bad to use reverb in your bedroom or have I just misunderstood what Bjorn said? I’m way late to the party but if anyone wants to hear the impact of reverb on recording, listen to the current remasters of the class ZZ-Top albums and then go listen to the original mixes, which are dry. That is a great way of highlighting how reverb is used in the studio. Hi Bjorn, have you tried the Neunaber stereo WET reverb? It sounds immense, a truly stunning reverb for ambience. I’d recommend it to anyone looking for a nice verb! What do you think of the line6 pod hd500 (and the hd500x)? I’m using the old POD X3 a lot. Love the Line 6 stuff! Check out this feature for some tips on digital processors. Just curious about my post on reverb, it’s still in moderation from two or three weeks ago. No worries, I know you’re busy, just a friendly reminder! Hope all is well. Behind schedule as always :) It’s approved now. Interesting article. i have a typically sized bedroom that I use as my studio and I have an affinity for a fatty tones width lots of width and depth. I use a compressor in almost everything I do. That alone helps to “boom” the tone and give it some life, if you will. when I want to create an intimate sounding tone I will use little to no reverb at all and add delay to create that sense of depth but one that I deliberately want to limit. Having said that I have always loved a “live” tone to music in general and if I want to create something like that even in my small space then I turn up the reverb and I can get that really warm “Pulse” sound. Hi Richard! What amp and guitar/pickups do you have? Let me know and I’ll try to help with the pedals. OK, I don’t know that particular model but in any case I’d go for something versatile. That will enable you to cover as much ground as possible with a minimum of pedals. You should look into the Mooer pedals. They’re really great. Check out the Hustle Drive (Fulltone OCD clone) for Tube Driver tones. That should cover Marooned and the overdrive tones. The Blues Mood is an excellent clone of the Boss BD2, which also goes nicely for most of David’s overdrive tones. For distortion I’d go for the Black Secret and for delay, check out the Reeco. See the Buyer’s Gear Guide for more tips. While not a big fan, Billy Squire set his amp at the end of a long hallway, with the mic at the other end, which gave him a very distinct reverb sound. I can’t remember where I read it, but it was a detailed article mostly about the recording of his guitars, and the reverb, and also gave some details about Eddie Van Halen’s micking techniques. I’ll try to find the article, it was quite interesting. So, the more reverb a venue/room, you play at, gives you, the less you need to add from a pa system, right? I understand now, how using reverb from your amp (although a cool effect, to our ears, on stage) can dampen the guitar sound and reduce its clarity and definition. We once did a Floyd tribute at an open square, next to the sea. In that case, where reverbations are “lost”, dodn’t you need some from the mixing console? Also, on a ’07 comment you replied that vocals and keys on live situations, are somewhat different. How so? Any suggestions on how to use the effect with each instrument (guit.bass.drums.keys.vocals) in concerts? I should point out that I’m no expert on the physics involved. There’s a lot going on when sound is projected. A sound guy won’t add any reverb to the PA mix unless it’s for a specific effect. The room, big or small, will provide the reverb. Open squares has lots of big reverb because the distance to the reflecting source is longer. Keep in mind that the ground, people, trees etc also reflect sound. If you were to add reverb in the mix, then it should be added in a small Club, where the reflections are short. Not in a large space. Again, reverb should be added IF you need a specific effect. I’ve had sound guys drencing us in reverb and delay but it sounds like a mess and they really don’t know what they’re doing. Vocals are often dry but some singers want a bit of reverb or delay depending on the music. In my band’s case, we often use a bit of delay on songs that have a bigger production. The more intimate numbers sounds better with a dry vocal. Keys or synths often sound better with some reverb but that’s usually added by the keyboard player as a part of his sounds. It’s important to know the difference between stage and recording. All recordings require some reverb but a stage production should utilize the Natural reverb of the room. 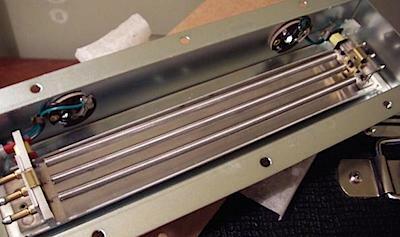 I’ve got a Catalinbread Talisman plate reverb that I love. It plays especially nicely with their Echorec delay pedal. I’ve made a comment some weeks ago at FB that should be considered when talking about reverb, delay and, also, “volume” effects. “We can not be naive (though fans) and ignore the fact that there is also the backstage work of a sound engineer on a huge mixing board that helps the musician on his performances. It is through this sound engineer that many “extra” resources as “echo to the vocal performances” are introduced live as well as some nuances/delays variations along the performances/recordings. Not everything is controlled â€œaliveâ€ by the musician, although we know that certainly Dave planned every detail and each setting and each timing.”. I have a hiwatt so it doesnt have reverb but im missing that certain echo dimension. what echo pedal would you recomend for that gilmour sound? …I think it will not be a Fender Custom Shop Guitar, just a “normal” signature stratocaster… I think $ 2000 – $ 2500 could be a realistic price. Maybe Fender will also offer a Tribute version (very, very expensive, includig scratches), but this is not confirmed yet. Well, we can always built our own DG strat, like you did. …Without a replica of all the scratches, it’s not really that important anyway. (but I must admit, it looks nice). Were did you buy that beautifull black 1-Ply Parchment? Your guitar looks very, very nice!! [I’ve heared different stories too and like you say, it seems like there’s gonna be two versions of the guitar. There are some reports on Duncan doing the pickups. I don’t know, it’s cool to see a Gilmour guitar being made but I don’t think I will spend my money on it. I love my “blackie” and I have never really understood the “artist” model thing. Guitars are very personal and I’d much rather customize guitar to my taste than spening thousands on someone else’s baby. Bill Callaham did confirm that his bridge-block is exaclty built like the original Fender Strats (pre-CBS versions, 1954 – 1969). Only, he did enhance the tremelo arm; it fits better. I will order one block and see what it will do. It’s not that expensive and it can easily be switched. Unfortunately, I own a Modern American Series Strat, which will never be 100% vintage / reissue, because of the modern (2 pivot) bridge and slightly different body-routing (there’s space for a humbucker or single coil bridge pickup). Collin if your looking for a small tube amp try and look for a princeton reverb or the champs. I own a princeton reverb, its 15w has i believe 6-8x tubes (pure tube nirvana) and an unbelievable spring reverb. Mine doesnt break up until around 6-7 on the volume knob and believe me thats pretty loud. The cleans are classic fender at its best. I would recommend patience as its hard to snag one without going trigger happy on ebay and shelling out around a grand for one. I almost did and found one a week later for $375 at a vintage shop about 2 hrs from my house. Good luck. i’ll let you know how it looks… guess i can send you a copy if you want..
a friend of a guy i know filmed it i think, he told me he had it on vhs somewhere…. i haven’t seen it.. I would really like to know how much effect that bridge block would have on the overall tone. By the way, small tube amps – I was thinking a Fender Blues Jr. It’s been getting some good reviews. Now I just need to make sure it stays clean, like you said..
some guy i know told me he had a PF experience show from 13.01.2001 smuget,oslo on -vhs.. is that you guys ? i use to have quite much reberb till 2 years ago when i was playing with my band in song like shine on part1. then lintening carefully my sond that it was not at the best, i could hear that a lots of revereb gets the sound drown , not much presence. mow i use just a little reverb for haveing a sound not too dry. anyway i would tell end listen your opinions about this: i ahve have a lexinon MPX1 i use for delay and reverb, i think is a must useing a unit to split the signal before going into the digital unit(delay and rev.) like this. and later re mix the dry sound with the effect. here’s some results of my latest rechearch, regarding the Tremelo Block from Bill Callaham. I am about ordering one of those Bill Callaham Blocks, because it comes very close to the original Fender block ’54 – ’69! They offer interesting upgrades (bridge / blocks with tremelo) for all kind of stratocasters (USA modern, USA reissue, Mexican etc.). They do get very good reviews (Harmony Central). Bill Callaham suggest that I shoold use one of there blocks. But I think that creating more sustain can also be dangerous, …the strat maybe (!) will sound less “open”! (Like blocking the tremelo with wood!). Also someone did mention that the balance of the actual sounds slightly changed: more mids! Also, the Callaham block “rings” more then the modern Fender versions. Quite a change I think. I really don’t know what to think! Still interesting to know: what block is David using on his blackie? …problably the original ’70 stock version, but I couldn’t figure out what kind of steel that is. Anyway, would be a simply mod with a great result? …or maybe absolutely not? i’ve seen that Dunlop has just building a replica of the Dallas Arbiter Fuzz, it is in the new Dunlop’s products line called Jime Hendrix authentic. Have you try it? did you use the deluxe memory man or the stereo? I checked out the Memory Man. Woo… I think I’m sticking with the DE-7, the Memo is EXPENSIVE!!! By the way, I don’t think my parents will like a half stack 5o plus in my room, so do you have any other suggestions as far as good (but low priced) tube amps go? In my opinion the best “reverb” effect you can use is the illusion that the delay effect makes! Using delay you cannot kill your sound and it seems like you have a big reverb (if you are able to use it). Regarding tape echo (BOSS DD20), do you sometimes use the two head option? If yes, can you give an example / song? Maybe Run Like Hell? … have you ever tested / heard the T REX Replica Delay? I like the article Bjorn. I must say that delay and reverb can be very nice sounding effects, but people go overkill. They don’t sound good when you set everything to ten, when will people realize that. For example, I would guess none of you listen to G3 but I like them, especially Vai (For the Love of God is an amazing track) but if you listen to the 2005 dvd at the beginning of the jam when Malmsteen comes out (please don’t ban me for mentioning him) he comes out and plays and the delay drowns out everything. It sounds terrible. I must admit though it was funny how low they decided to mix his guitar. Bjorn, I agree with you that reverb can definitely change your tone and obviously this being Gilmourish.com…lol, you’re right in that Gilmour doesn’t use a reverb unit on stage, but I would like to add that a lot of people don’t realize how little of the actual amplifier’s sound they hear at many concerts so for those that maybe don’t know I’ll add a little insight on this idea. I’ve been to over 200 concerts in my life and I recently saw Eric Clapton and on stage Eric is currently using a 57 Fender Twin and at 40 Watts that’s not a lot of volume to get over 20,000 screaming fans. So, the amp is mic’d and ran through the PA and most of the guitar work you are hearing is being put out through the PA system. Now, that amplifier doesn’t have reverb on it, so what’s done is it’s added on the mixing board because in general there is a reverb knob for each channel on the huge boards used at large concerts. But basically all I’m saying is a lot of times that’s where the reverb comes from. Now granted it’s not a lot, usually just a touch, because there is some reverberation because of the acoustics of a large venue. But basically I just wanted to say that because everything is mic’d and thrown through the PA, rarely do you actually hear the exact sound onstage, unless you’re right up front. Another example I can give is, Eric Johnson who runs 2 Fender Twins on Stage with the Volume on 3 so that they can be mic’d but he also runs his Reverb on those amps at 4 as well as running delay for a really wet sound. Some people lust after Johnson’s tone. Some people don’t, obviously it’s a matter of taste. You mention the natural reverberation from playing in a hall or building and that’s true, but in all the places I’ve ever played it’s never been enough so I’ve always added some Reverb. Now I don’t run as much as I would in a small room, but I always run some because as you said, it’s personal taste. I personally can’t stand a dry sound. I like things to sound like I’m playing to 20,000 people in a huge arena even when it’s only a 1,000 in small club. So I usually run a touch of reverb and some echo as well. My amps are almost never mic’d because I play about as loud as Hendrix use too…lol. I run 2-3 tube amps (Fender, Dean Markley & Peavey 5150) all around 100 Watts and I usually run them around 6-8 on volume. A lot of times I’m playing outside too for big crowds so I need more volume and I also add more reverb because there’s nothing to echo around on. Just something I wanted to add. It sounded like a lot of people thought reverb was some big evil thing and usually reverb is on everything. Whether it’s added by the amp, the pa system or the mixing board when recording an album so I see reverb as something I love and use often, but I think the key is to not put on TOO much, depending on where you’re playing. Not sure how I feel about reverb, sometimes it’ll add that extra umph to a seemingly thin sound. I find myself playing a lot w/ reverb and delays which I now realize is really hindering my guitar playing in terms of becoming a better player. Thanks for the article it was very informative. Me personally I dont gig, rather just practice in my room, and ive got a Fender Princeton Reverb amp, which you may know the reverb on those amps is unreal– arguably better than the deluxe and twin amps. I don’t mind helping you write a Bass article. I play electric Bass, and classical-style upright Bass in my school’s Orchestra, so I figure that I can be of assistance. I agree very closely with the basic concepts you’ve outlined. In fact, your comments on the use of delay to smooth out distorted tones (and by extension, create a more realistic dimensional image w/ stereo delays) is something that most guitarists fail to understand. This is a very important tool in the studio. I would add to this by saying that reverb can be used in a way different then originally intended. On occasion, I have used very mild reverb to modify the fundamental sound of the guitar I am using. For instance, most people would never think of getting a warm jazzy tone out of a stratocaster, however if you run it through a very gentle reverb prior to amplification, you can give the impression of a hollow body. Add some mild chorus in the fx loop, and you have a very different sounding instrument. Effects can be used in one of two fundamental ways. 1) Effects can be used to enhance the natural sound of the instrument. 2) Effects can be used to mutate the sound of the instrument. Neither philosophy is correct or incorrect. In fact, David Gilmour is an example of both uses. BTW, I’m looking for a nice Sheep bootleg from ’77. Do you happen to have one, or know where I can get one? I have some sound files from some bootlegs on Gilmour’s tour in Venice, id you’d like to trade. The man has access to incredible things… a joy to listen too, great podcasts. Heck, between him and Gilmourish I have became more than a fan but rather a competent expert in Floyd stuff… thanks Bjorn, this site is a place of constant visit… learned a lot from you bro. Bjorn, have you ever thought about writing some articles on Gilmour’s basses? You have to admit his playing on Animals is pretty good. great article bjorn, and it really refelcts my own experiences. I used to use some reverb in the very early days of my playing, but I got dissatisfied with very quickly. generally speaking, I’ve been playing with delay for years, but stripping it back more recently. guess it’s part of finding your own style and tone. when at home I play with a very stripped back setup, which includes an ehxdmm at the very end of my chain, not only a great preamp, but also a great way of enhancing the nuances of your playing. the memory man is very lush, and as long as you’re not looking for any too exact delay things, it’s the unit for me that provides me with a natural soft delay instead of reverb. Thanks for the excellent article. Very informative and you bring up some great points. As a Fender Twin player I know just how easy it can be to get lost in all that reverb. And nice job mentioning Sigur Ros – I saw them a few times during the “()” tour and they were always amazing. I actually find that even in my small bedroom, using the reverb from my digital effect box through my amp sounds terrible. Maybe its the effect itself, but it always sounds way over the top. Of course when I’m playing with headphones hooked up to the effects box it sounds great, but playing through the amp delay is all i need to smooth out the sound some. BTW the ibanez delay is really nice! I am having a hard time dialing in a good “Run like Hell” setting though. Just need a tuner and a volume pedal and I can finally get rid of that digital effects box! I have to agree. Using reverb as an “effect” live is sometimes fun for Post Rock/shoegaze type stuff like Sigur Ros, EITS, or even Mogwai, but if you have a nice toneful/chimey amp like a Hiwatt, Reeves, Sound City, etc….you don’t really need it. In the early days, I was a Fender amp reverb junky. I’ve learned that if your tone doesn’t sound good without reverb, you don’t really have good tone, IMHO. Recording/mixing is a different ballgame. Great article BjÃ¸rn, and I completely agree with you. At home I sometimes use a hint of the spring reverb on my AC30 to smooth out the tone a little bit, but I never use that live. Take some of the most beautiful well known guitar parts in history; or even the most mystical, dreaming, or whatever…..erase the reverb and it remains: nothing! For me, reverb is the most natural, undisturbing effect of all, giving me inspiration while playing….make me fall into my riffs, lines and melodies….a guitar is the same like vocals in this regard…..vocals recroded without reverb in record history? ?….not to imagine how terrible this would be. here’s a article about recording on an island…. Link: Sound on Sound interview with On an Island engineer Andy Jackson. I am no experienced in playing at venues, but my reverb on fender delux reverb is still one nut subtle just to give a touch of life. Space with nice analog delay currently vapour trail. I totally agree with you BjÃ¸rn regarding the significant pros of not using reverb in a band, and especially at larger venues. But when playing at home, and trying to blend with a cd or dvd, I consider reverb a great tool if used in the right way. But that is my humble opinion anyway! Great article Bjorn. Every bit was informative to me! I had no idea. Nice article Bjorn! Completely agree with your opinions…..I have seen (heard) how using reverb on strage can ruin your overall tone…. I will definitely keep away from reverb when building my rig. I think I understand now why it isn’t too wise to use in a hall. By the way, that SC 50 Plus that Leandro (I think) linked has dropped off eBay :(. I’ll just keep a-lookin’. Great article Bjorn and I do completely share your opinion! It can be nice to create some space in a mix of a recording to add some (stereo) Plugin-ambience-reverb for the lead solo. Sometimes I also use a software Plugin Delay… When you work this way, you can always go back to the original dry guitar and have 100% control of everything. Also, it makes editing like cutting / pasting etc. a lot easier!